We've been selling, installing, customizing, and replacing all of these systems for over 50 years and understand how to achieve complete customer satisfaction. That's why, with every project, our Rancho Bernardo clients can expect honest recommendations, upfront estimates, quality materials, expert installation services, extensive warranties, and very low prices. It is our commitment to 100% customer satisfaction that has earned us a reputation for providing unbeatable value. As a testament to this, we have thousands of satisfied clients throughout San Diego County, an A+ rating from the Better Business Bureau, and over a third of our business coming from returning customers and referrals. As an experienced licensed contractor who has worked in the patio cover industry for decades, we know that the highest quality patio covers are manufactured by Four Seasons Building Products. They make patio covers that feature better construction and thicker structural aluminum than any other patio cover manufacturer. Plus, they are the only ones who bake on primer before applying paint (other manufacturers apply paint directly onto the aluminum), making their products virtually maintenance free and exceedingly durable. Moreover, Four Seasons Building Products stands behind their products with a Limited Lifetime Warranty. Call owner-operated Aluminum City today at (619) 562-1652 to start designing your new patio cover, carport, sunroom, window awning, or door hood in Rancho Bernardo. Business hours are from 7am to 10pm, 7 days a week. Our owner answers all calls (or, if he misses your call, he'll call back within one to two hours), and he'll be happy to talk with you over the phone or set up an appointment for an on-site consultation anywhere in Rancho Bernardo or San Diego County. Consultations are free and require no obligation. During a consultation, we'll take measurements, review photos and style/color options, and provide a complete quote with estimated completion date. Aluminum City provides Rancho Bernardo residences and businesses with the best value in patio covers in San Diego County. Constructed with top quality, structural aluminum from Four Seasons Building Products and built to be strong and long lasting, our covers are the perfect addition for any patio in Rancho Bernardo. Customers choose Aluminum City because our patio covers are resistant to rust, rot, flaking, and chalking; able to withstand Rancho Bernardo's harshest weather conditions; and competitively priced. Our patio covers are highly customizable and can accommodate lighting fixtures, ceiling fans, and decorations. 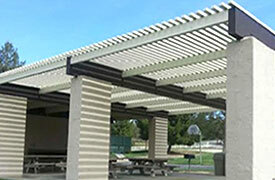 We are a locally owned and operated, full-service patio cover company with more than 50 years of experience, and we are proud to say that our commitment to quality, affordability, and customer satisfaction has allowed us to build strong long-term relationships with our valuable Rancho Bernardo customers. To learn more about our versatile and durable patio covers, call Aluminum City. We provide all Rancho Bernardo clients with free on-site consultations and estimates. 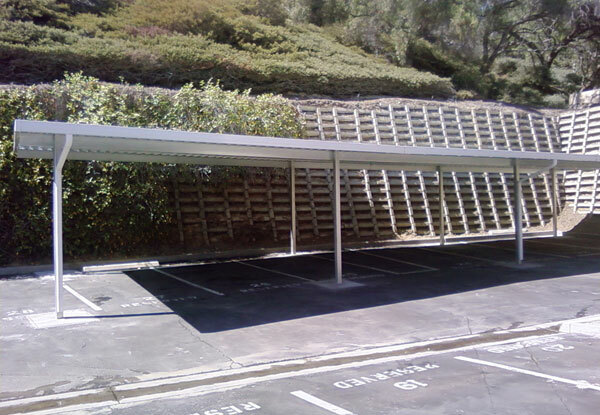 Aluminum City is Rancho Bernardo's best choice for high-quality, custom-built carports to protect a homeowner's personal vehicles or a company's fleet of commercial trucks, vans, and service vehicles. We can build our carports to nearly any size and have them surface mounted or freestanding. 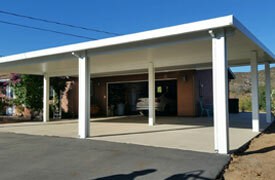 Additionally, our carports can be primarily functional or designed for a more stylish aesthetic. We are proud to be a factory-authorized dealer of Four Seasons Building Products, one of the largest and most respected manufacturers of aluminum shade products in the country. Four Seasons Building Products is one of the few suppliers to use a baked on primer before painting, ensuring that your carport will be long lasting, durable, and beautiful for years to come. Made with structural aluminum panels, which are locked and sealed in place, they offer a significant amount of protection for cars, boats, machinery, electrical equipment, and more. To learn more about our custom carports, call Aluminum City. 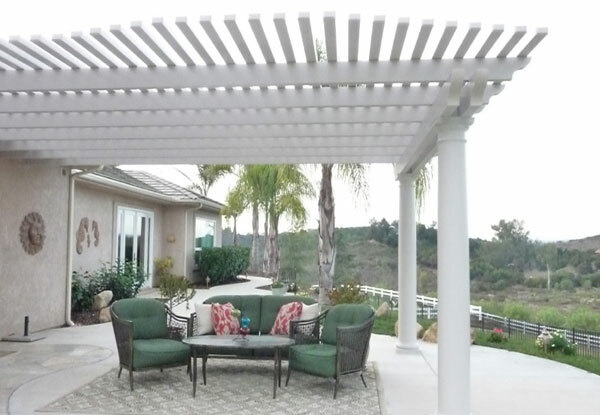 Aluminum City's lattice patio covers and pergolas are an affordable and beautiful addition to any Rancho Bernardo property. These highly customizable patio covers are crafted using top quality aluminum from Four Seasons Building Products, a leading manufacturer that is known for providing one of the best warranties in the industry for patio covers. When you call and make an appointment with our patio cover experts, you'll be able to make well-informed decisions about the design of your pergola or lattice patio cover. Options include whether to make your patio cover freestanding or attached; which type of style, end cut, and column or post to select; which color will best complement your property; how far your lattice should project; and whether you should choose a smooth or wood-grain texture. Call us today to schedule a free on-site consultation. We'll come to your Rancho Bernardo home or business and review photos and options as well as take all the measurements we need to provide you with an upfront and accurate estimate. 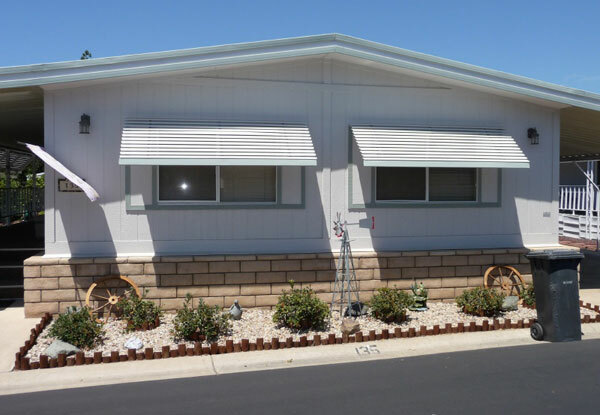 Keep the sun's hot glare from getting into your Rancho Bernardo home or business by having Aluminum City install one of our attractive, affordable, and long lasting window awnings. For over 50 years, Aluminum City's affordable window awnings have helped customers significantly reduce the amount of sun that enters their windows, resulting in less need to run the air conditioner. Not only will our window awnings effectively dissipate the heat, but our awnings also offer dimension and curb appeal. 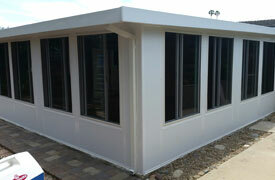 We can custom design them to perfectly fit each window and, with over 20 colors to choose from, complement your building. Each window awning is made of durable, long-lasting 3½-inch aluminum slats. 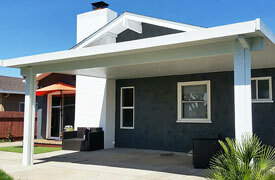 These Panorama-style awnings can be seen throughout San Diego on homes, office buildings, apartment complexes, retirement homes, restaurants, mobile homes, and other residential and commercial buildings. Call the awning professionals at Aluminum City to find the perfect window awning for your Rancho Bernardo, California, home or business. 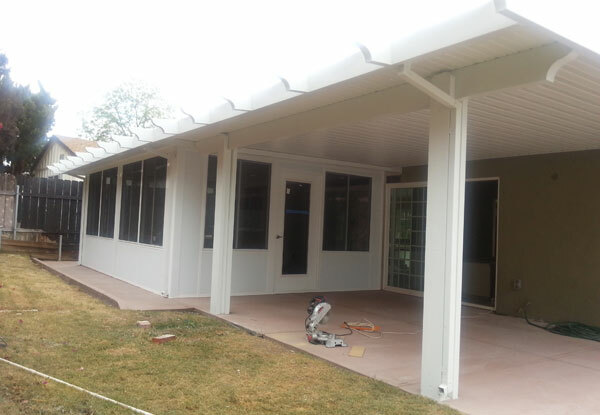 Expand your entertaining and living space by having our professional shade system installers build a patio room for your home or business in Rancho Bernardo. Patio rooms, or California rooms (as we like to call them), are always custom designed to meet our clients' needs and budgets. In general, patio rooms include insulated roofs and walls; dual-glazed, low-E windows; standard or sliding doors; gutters for proper water drainage; and an electrical raceway for ceiling fans and lights. Upon request, we can also put in a skylight. At Aluminum City, we understand that adding rooms can be costly and time consuming; however, Aluminum City's California rooms provides an more affordable alternative that takes just a fraction of the time to complete. To extend your living space in Rancho Bernardo, call Aluminum City today. All California rooms are built to code and backed by Four Seasons Building Products' Lifetime Limited Warranty. 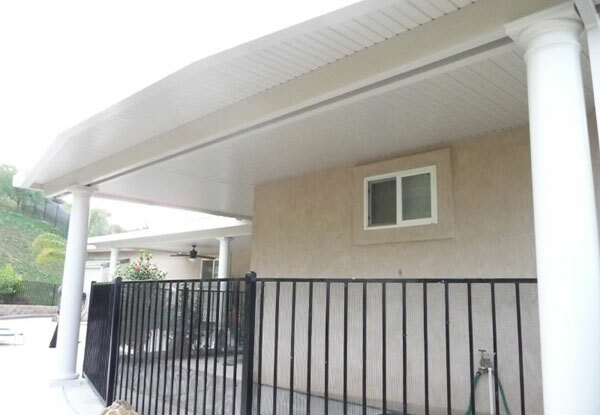 Thank you for doing an excellent job of installing the patio cover at my home in Temecula. You and your work was very professional and I appreciate the great job. You are a credit to your trade. 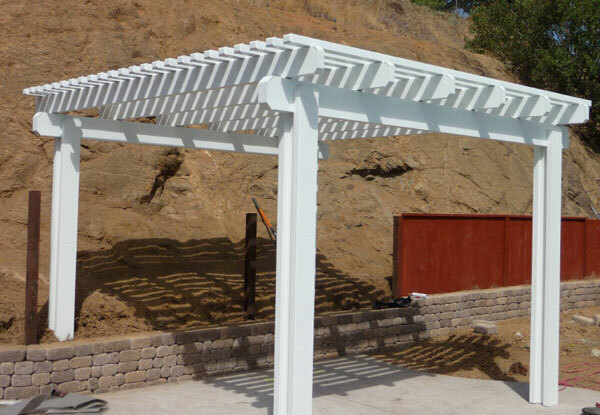 This patio cover in Rancho Bernardo, CA features dual beams and 10" roman columns. Aluminum City custom cut the lattice tubes to create a curved effect.